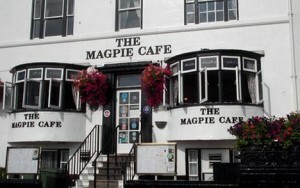 Whitby has a wealth of restaurants, cafes and pubs. Listed below are a few of our favourites. Housed in a distinctive black and white building overlooking the harbour, the Magpie Café is in a prime position for you to enjoy the fabulous views of Whitby at the same time as sampling a wide selection of meals. Specialities include dishes that use prime fresh local fish, seafood and specially selected ingredients. Has one of those enviable, picturesque settings, nestled close to the busy fishing harbour of this charming, bustling coastal town in Whitby. 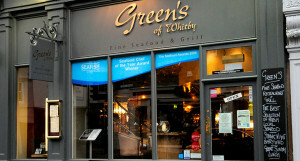 Rob & Emma Green have created a winning combination at Green’s Restaurant & Bistro by offering two distinct dining experiences – a buzzy Bistro atmosphere downstairs, and the more formal – but equally welcoming – ‘Upstairs at Green’s’. Prime local meats and game are also a speciality, and by making the most of the landscape as his larder, with its abundance of fresh local produce, means that Rob changes the menu frequently to offer you “the best of the day”. This has been instrumental in Green’s Restaurant & Bistro being recognised as not only one of the finest restaurants in Whitby, but one of the finest restaurants in North Yorkshire. Tucked away in Angel Yard, which is just in between Baxtergate & New Quay Road, The Singing Kettle is a very popular Café, offering fresh home-cooked food. 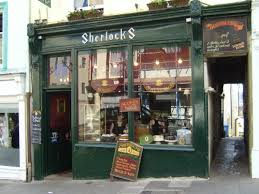 Serves a full English breakfast! Dog friendly. 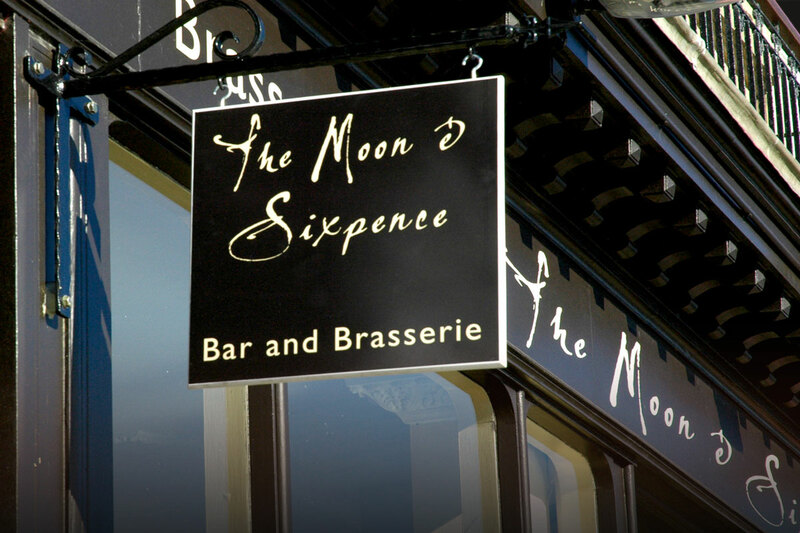 The Moon and Sixpence is situated right on the harbour-side in Whitby. It provides a relaxed and stylish place to meet for a drink or meal during the day or evening, with some of the best views in town. The bar serves a huge range of exciting and delicious cocktail drinks, expertly mixed and served by trained bartenders. The brasserie serves fresh, local food prepared daily. 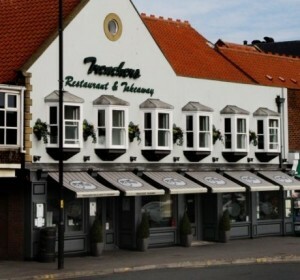 Established in 1980, Trenchers seafood restaurant in Whitby is well known throughout the North of England for its traditional menu of fish and chips and many other seafood delights served all day throughout the year. Serving fish of the finest quality, which is hand prepared on site and cooked fresh to order the Yorkshire way in traditional beef dripping. Priding themselves in serving fresh salmon, crab and of course mouth-watering Whitby scampi. A restaurant favourite is the delicious steak pie and not forgetting the very popular home made Trenchers fish pie and appetizing fresh crisp salads. There is also a variety of children’s meals to excite the younger taste buds. 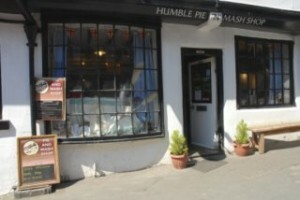 Over the years Humble Pie has been providing an antidote to the area’s plethora of chippies, whilst maintaining traditional seaside charm. Home made fresh each morning, each pie is encased in their made-from scratch pastry, and comes in a massive range of flavours using meats and veg from local farmers. From traditional Slow Braised Stout & Leek, to the more unusual such as Sausage & Black pudding pie or Hommity Pie (every veggie customer’s favourite! ), the vast array of flavours is sure to satisfy anyone. With an entire dinner coming in at under £6 per person, Humble Pie’n’Mash is perfect for a comforting yet uncostly dinner and a fantastic place to feed the whole family. Ditto offers you a contemporary and exciting menu cooked to the highest standard. All ingredients are of the finest quality and sourced from the best local suppliers,with a specially selected, quality wine list to complement your food perfectly. 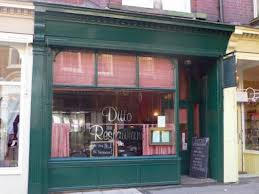 Ditto is a small, intimate and relaxing restaurant with seating for up to 20 covers. With a dedicated front of house team, an evening spent at Ditto will be a memorable occasion! 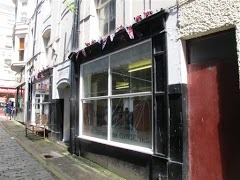 Opening times are Tuesday to Saturday, 6.30 – 9.30pm. Bookings are advisable to avoid disappointment! 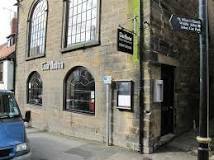 Lovely Italian restaurant opened in August 2010 with a wide varied menu serving pasta, risotto, pizza, fish and meat dishes; all prepared freshly on premises .You will not be disappointed ..